Master the nuances of successful service line marketing. This comprehensive book guides healthcare executives through proven marketing strategies to grow their service lines. You'll examine case studies of successful marketing campaigns and discover techniques that you can immediately apply to your own marketing approach. 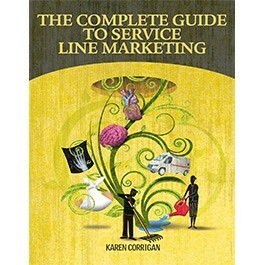 The Complete Guide to Service Line Marketing explores best practices for market research and competitive analysis, and for presenting an effective campaign to the public. You'll strengthen the way you promote your vital service lines, oncology, cardiovascular, orthopedics, neurosciences, and women's health, and generate more physician referrals. Karen Corrigan is chief strategy officer for Navvis & Company, a healthcare consultancy providing counsel on strategy, leadership, and performance to health systems, hospitals, and physician organizations. Corrigan is a leading proponent for value innovation in the health industry, and speaks and writes frequently on the development and growth of integrated health systems, competitive positioning and differentiation, and brand building and strategic marketing. She leads the firm's Innovator's Studio for chief marketing and chief strategy officers. Prior to joining Navvis & Company, Corrigan founded and served as CEO of The Strategy Group (TSG), a management consultancy specializing in competitive strategy in the health industry. Before TSG, Corrigan was the vice president of system development for Sentara Healthcare (Norfolk, VA), and previously held similar positions with other health systems in Virginia.